A wide range of services are available depending on suitability, budget and personal preference. The following list are examples of typical types of china repairs and restoration. Helen also has extensive experience of repairing other related materials, such as glass, jade, ivory, marble, onyx, alabaster and resin. 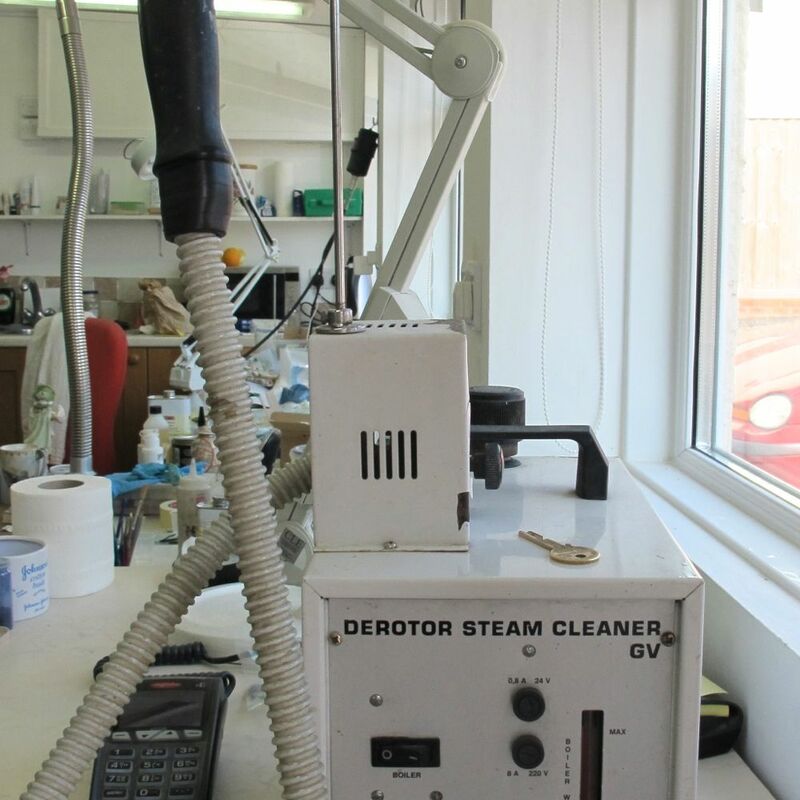 All objects undergoing repair are thoroughly cleaned before any conservation or restoration treatment is carried out. This can be by use of a steam cleaner, washing in mild detergents, dry brushing or swabbing with solvents. Many objects have been previously repaired and have evidence of surplus glue, poor overpainting, lacing or wiring, poor alignment of break edges and unsuitable materials used to fill gaps, to name just a few. This has to be carefully removed before further treatment can be effective, in a way that will not cause further damage to the object. Some adhesives and fillers break down in water, but others may require the use of solvents to dismantle the repair. Iron supports or dowels used to join pieces in previous generations need to be removed as they can cause staining, as can bronze lacing and rivets. Depending on the type of stain it is usually possible to remove or lessen the intensity of stained areas. Organic stains often found on domestic ware usually respond to cleaning with biological washing powders. Other type or more stubborn stains may require bleaching with an oxidizing agent such as an appropriate volume strength of hydrogen peroxide, as determined by the restorer. Household chlorine bleach should never be used under any circumstances, as it can cause salt damage which lifts the glaze over time. Metal stains can be removed with various oxides, depending on their type. Poulticing is a commonly used method for stain removal which targets the local area and avoids the need to soak articles in large quantities of solvent. The poultice serves to lift the stain out of the ceramic body as it dries. Once all the pieces are completely clean and all previous repair material has been removed objects can be reconstructed and re-bonded with a suitable adhesive for the pot body. There are a number of specialist, conservation grade products to choose from which are designed not to yellow with age and fit the criteria of being reversible or easily removed. Gilded ceramics and glass with worn areas of decoration or where replacement areas have been re-modelled can be re-gilded using genuine gold leaf or gold powders. Missing pieces and chipped areas can be re-filled using a a variety of mediums. A conservation approach could be to fill areas with a tinted resin which is sympathetically colour matched to the surrounding area. To restore a filled area it may be necessary to airbrush or hand paint a “false” glaze over the area and re-touch in any decoration. Missing Parts can be replaced by hand modelling a new piece or moulding from an identical piece and casting a replacement. It is often possible to make a new handle by moulding from another one, for example. Where a copy is not available to mould from, careful research is necessary to determine what the missing area looked like before hand modelling a replacement piece. Cracks are a common form of damage on porcelain and pottery. After cleaning thoroughly cracks can be secured by consolidating them with an appropriate adhesive. This will prevent further weaknesses which could cause the crack to run and from the crack getting very dirty over time if left unrestored. Consolidating cracks will usually restore the “ring” that a bowl makes when a finger is flicked over the rim. These are also common, as when a piece of porcelain is fired tensions are created which are released when the porcelain is broken and relaxes slightly. This can cause a step or ridge, creating inaccurate alignment when the break edges are held together. Sometimes its is possible to align the sprung edges during the bonding process by holding them together with strong tape. More severe springing, however, will require the use of specialist clamps. Chips can be filled and shaped with a variety of filling mediums appropriate for the type of porcelain or pottery. A resin fill can be used for a conservation “museum” type of repair or filled chips can be overglazed to match the surrounding area when a restoration approach is adopted. Replacement pieces can be reproduced by moulding an identical or similar piece with silicone rubber and casting a new piece in plaster or resin.